What is the Average Unit-Size Density Incentive Program? On July 30, 2013, the City Council adopted SBMC Chapter 28.20, the Average Unit-Size Density (AUD) Incentive Program. The AUD Program is intended to encourage smaller, more affordable housing units through the application of increased densities and development incentives in selected areas of the City. The AUD Program will be in effect for a trial period of either eight years or until 250 residential units have been constructed in the areas designated for High Density Residential or the Priority Housing Overlay, whichever occurs earlier. Any application for new units that is deemed complete prior to the expiration of the Program may continue to be processed under the AUD Incentive Program. It allows densities ranging from 15-63 dwelling units depending on the number of units per acre being developed. Intended to encourage smaller, more affordable housing units through the application of increased densities and development incentives in selected areas of the City. Bildsten Architecture and Planning is an architecture firm that specializes in Average Unit Density projects. We can assist you with determining feasibility and designing your AUD project from start to finish. To learn more about the AUD program, please fill out the form below to receive a free guide. Santa Barbara neighborhoods benefit from having a variety of building uses close to one another. Mixed-use buildings with stores, restaurants and other businesses on the ground floor and live-work apartments above, are active in some way at all times of the day. People who live in these apartments can walk in their neighborhood for shopping, dining, work, school, services and recreation. This reduces traffic and parking congestion on our streets and enriches life in the community. A recent survey conducted by the SB Coastal Housing Coalition shows that people hired for skilled jobs in the last 15 years in Santa Barbara struggle to find affordable and desirable housing. Many either leave our community for more affordable areas, or live far away and commute into Santa Barbara on our congested freeways. It’s time for a more sustainable solution. 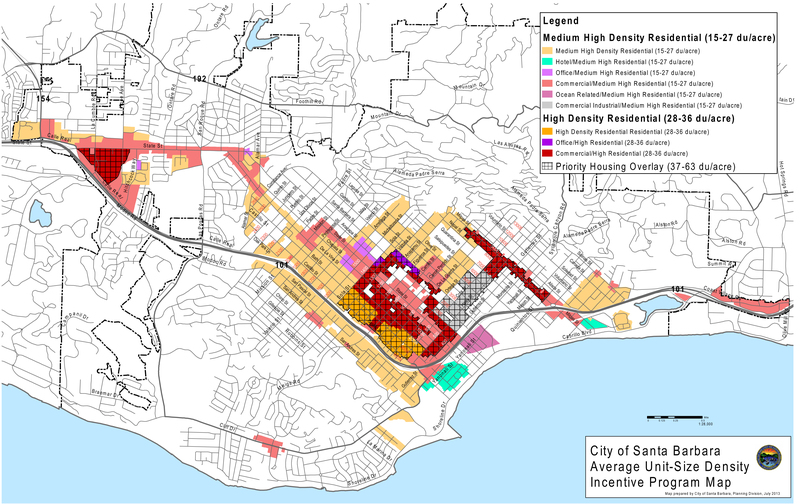 Santa Barbara currently allows higher-density housing construction in certain parts of the city. Properties on the map below that fall in the hatched area are allowed to build up to 63 units per acre of lot area. As an example, if your property size is 50 by 100 feet, 7 units maximum are allowed, with one car and one bike parking space required per unit. This zoning allowance is called Average Unit-Size Density or AUD. The AUD policy will be in effect until 2021 or after 250 units have been constructed, at which time the policy will be re-evaluated. Redevelopment of your property may be worth considering!